Meet MELVIN. He is a 2 year old BROWN TABBY with WHITE male. Melvin has an AMAZING PERSONALITY. He loves his TOYS and is EXTREMELY PLAYFUL and loves to CLIMB. He is SUPER CURIOUS and really likes to EXPLORE his surroundings and look out the window, day or night. He is VERY OUTGOING and AFFECTIONATE. He will roll on his back for BELLY RUBS. He likes to gives HEAD BUTTS. He PURRS a lot. In fact, he’s a real CHARACTER. Melvin can get along with other cats after a slow and proper introduction. 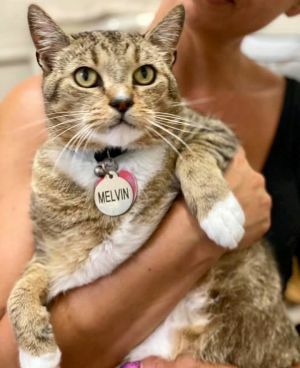 Come and meet Melvin and you’re sure to fall in love! He is staying in Long Beach, NY. He is neutered, UTD on shots, and FIV/FeLV negative.